Dread Spiders are a highly poisonous breed with a shell as hard as steel. 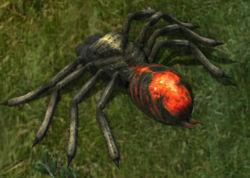 Dread Spiders that spawn overland and in dungeons had their statistics increased significantly in an attempt to thwart unattended script farming. Currently, the increases also apply to Dread Spiders that spawn as part of the Arachnid Champion Spawn, but it is believed that this may be changed in the future. Dread Spiders that spawn from Treasure Maps were left unchanged, as they are rarely, if ever, scripted. As part of Publish 48, the buffs to Dread Spiders from Publish 43 were reverted in favor of nerfing their lootpacks instead. Lowered Dread Spider loot to match new difficulty. Immune to Level 5 Poison and below. Rare chance to inflict Level 5 Poison. This page was last modified on 20 February 2019.